When Pigs Fly Returns: Torosaurus latus is not Triceratops sp. Torosaurus latus is not Triceratops sp. Earlier this year, Scannella & Horner hypothesized that skulls attributed to the large chamosaurine Torosaurus latus represented a “fully adult” ontogenetic stage of Triceratops, thus invalidating Marsh’s pierced lizard as a distinct taxon. This theory was based in part on a growth series for Triceratops published by Horner & Goodwin in 2006. In neither paper do the authors consider Triceratops at the species level. Prior to 1996, as many as sixteen separate species of Triceratops had been considered valid, but in that year Catherine Forster published a revision of the genus which greatly reduced that number to just two: Triceratops horridus and Triceratops prorsus. Actually, in 1986, Ostrom & Wellnhofer went as far as suggesting that only Triceratops horridus is the only valid species. Neither Scannella & Horner nor Horner & Goodwin address the issue of species-level ontogenetic change in Triceratops. Is the Horner & Goodwin growth series for T. horridus or T. prorsus? Is Torosaurus latus the “fully adult” form of T. horridus, T. prorsus, or both? While not stated outright, the Horner & Goodwin growth series implies that features used by Forster to distinguish T. prorsus from T. horridus may simply be ontogenetic markers, including size and shape of epioccipitals, size and shape of the nasal horn, and curvature of the postorbital horns. Certain abstracts that I’ve read but don’t know if I can actually divulge have suggested stratigraphic or anagenetic reasons for the changes between Triceratops species. 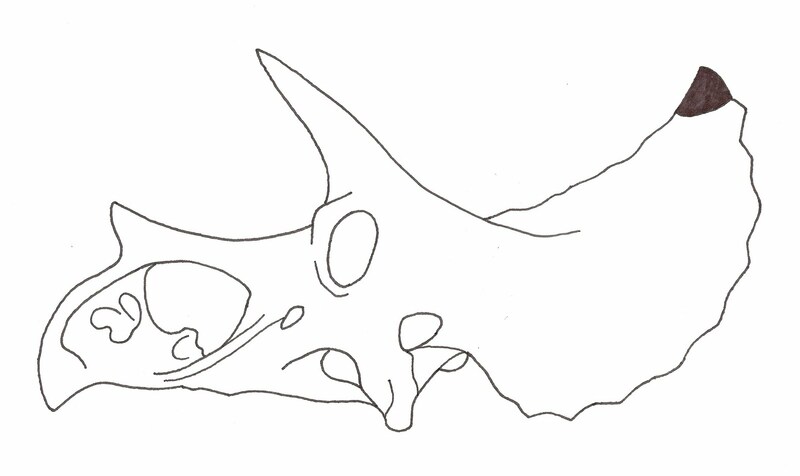 In Scannella & Horner’s “Toroceratops” hypothesis, the authors suggest that, very late in life, Triceratops goes through radical morphological change: the length and shape of the frill increases, and the parietal becomes rapidly fenestrated as bone is reabsorbed on either side of the parietal bar. 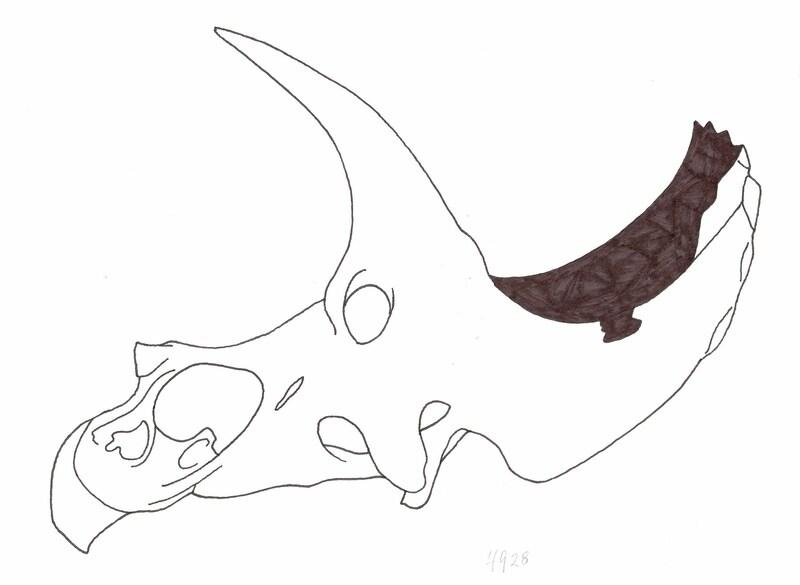 The authors point to a number of Triceratops skulls with extremely thin areas of the parietal where fenestrae would be expected to appear. However, none of the specimens investigated by the authors have even incipient parietal perforations (except Nedoceratops, but we’ll get into that in a minute). All investigated Triceratops skulls retain a solid frill. That is, the authors cannot point to any Triceratops skulls that would form a transition between the "no fenestrae" condition and the "big fenestrae" condition of Torosaurus. With the often-stated abundance of Triceratops material, I believe this is an important consideration. According to the Horner & Goodwin growth series for Triceratops, specimen MOR 004 is regarded as an “adult” form. It has thick, forwardly-curved postorbital horns; elongate, highly reabsorbed epiparietals; a large, thick, forwardly-directed nasal horn; and a relatively short, deep rostrum below and anterior to the nasal horn. If MOR 004 is the model adult form of Triceratops, then no currently recognized specimen of Torosaurus latus conforms to the Horner & Goodwin growth series. 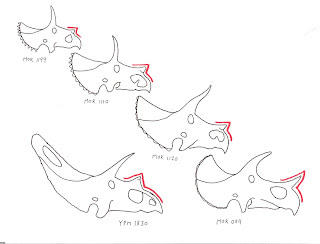 All currently recognized specimens of Torosaurus latus (ANSP 15192, MOR 1122, YPM 1830, and YPM 1831) have short, upwardly-directed nasal horns with an elongate, shallow rostrum anterior to the nasal horn. Additionally, the snout has a distinctive “stepped-up” morphology wherein the dorsal margin of the rostrum anterior to the nasal horn is lower than the dorsal margin of the rostrum behind the nasal horn. This feature is similar to the “large juvenile” and “subadult” examples of Triceratops in Horner & Goodwin’s growth series. However, even those Triceratops specimens lack the elongate, shallow rostrum anterior to the nasal horn. 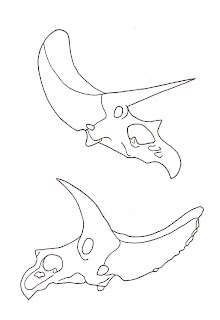 Diagonally from top to bottom, the proposed Horner & Goodwin growth series for Triceratops showing overall trends in morphology. To the lower left, Torosaurus latus. The overall shape of the frill is quite distinct in both taxa. 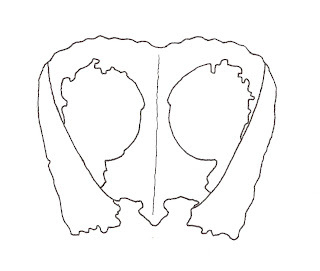 In MOR 004, the frill more or less frames the rest of the skull in anterior view: the parietal bar forms the apex of the frill, and the left and right halves of the frill slope down and out from there. This is especially obvious in two other specimens of Triceratops: YPM 1822 (Forster 1996) and YUM 1822 (Hatcher 1903). In lateral view, the frill attains a distinctive upward curve. Additionally, the squamosals of Triceratops are D-shaped, or perhaps axeblade-shaped. In many individuals, the squamosal-parietal suture is not visible for most of its posterior length. 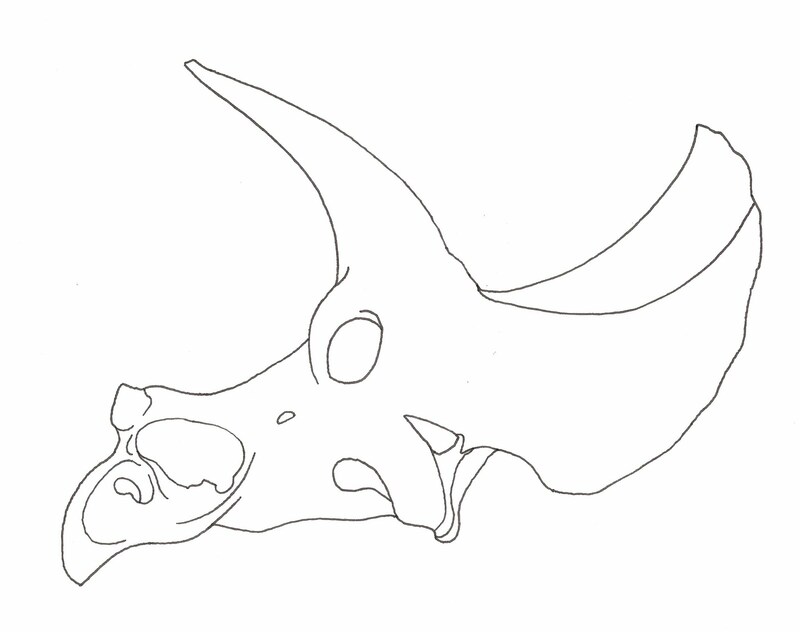 In contrast, Torosaurus’ frill is broad and largely flat, and does not frame the face in anterior view. Rather, it grows away from the rest of the skull and does not retain a distinct upward curve. Additionally, the squamosals in all recognized specimens of Torosaurus have a distinct shape reminiscent of a chef’s onion or paring knife, and the suture between the parietal and the squamosals is surprisingly clear along its entire length. The largely complete frill of Torosaurus latus, after Hatcher 1903. 1) Relatively small, upwardly-directed nasal horn that is triangular and develops about halfway up the snout. The horn never grows into the impressive forward-pointing thick horn you see in many Triceratops skulls. 2) An elongate, shallow rostrum anterior to the nasal horn. There is a clear height differentiation between this region and the dorsal margin of the skull behind the nasal horn in the adult stage. This may be termed a “stepped-up” condition. 3) An elongate nasal passage retained into the adult stage. In Torosaurus, the extent of the nasal system resembles the juvenile condition in Triceratops. In that taxon, however, the nasal passage compresses and rounds out as the subadult and adult stages are reached. Torosaurus, by contrast, retains an elongate nasal passage. 4) Blade-like squamosals which remain distinct from the parietal even in the adult stage. 5) An elongate frill that is “swept back” rather than “swept up,” is relatively flat and broad, and contains large parietal fenestrae. In adults, the margins of the frill may be almost completely smooth due to the absorption of the epioccipitals. Before we go too much farther into Torosaurus, let’s turn our attention to Triceratops. In fact, let’s go back to Forster’s paper regarding species diversity in that genus. She references two individual specimens as models for the two species of Triceratops: YPM 1822 for T. prorsus and SDSM 2760 for T. horridus. I note that the latter displays several features in common with Torosaurus, including the structure of the snout and nasal horn (though not to the same extent), and possibly the structure of the squamosals. It also seems to lack distinct epioccipitals, and the frill is broader than its sister species, T. prorsus. That species, represented by YPM 1822, shows very different features: the nasal horn is large and directed forward, the rostrum in front of the nasal horn is short and deep, and the nasal area is rounded. The epoccipitals are fairly large and triangular. Neither skull displays a singular suite of ontologic characters consistent with any one growth stage according to Horner & Goodwin. In SDSM 2760, the morphology of the snout and nasal horn are juvenile characters according to the suggested growth series, whereas the thickness and orientation of the brow horns, as well as the loss of epioccipitals, are indicative of adult status. By contrast, YPM 1822 shows a clearly adult snout and nasal horn, but the ends of the brow horns point a bit upwards (a subadult trait) and the frill retains distinct, fairly large epioccipitals (a juvenile or subadult trait). Are these isolated incidents? I’m afraid not. Just ask John Hatcher. In 1903, he included several beautiful illustrations of skulls attributed to Triceratops in his wonderful monograph on the horned dinosaurs. Exactly none of them conform to the Horner & Goodwin growth series to a "T." Going forward, where I reference "juvenile," "subadult," and "adult" features, I'm talking about those ontogenetic stages as defined in Horner & Goodwin 2006. This is USNM 2100, identified by Hatcher as Triceratops prorsus(?). Although the anterior portion of the snout is missing, one may notice the underdeveloped nasal horn (juvenile-subadult), low-angled brow horns (adult) with sloped tips (subadult), and small but distinctive epioccipitals (subadult). The parietal bar is interesting in that it’s quite bumpy. Where would USNM 2100 fit on Horner & Goodwin’s growth series? This is Triceratops brevicornus, ”YPM” 1834. It also shows a curious mix of characters: the nasal horn is distinct and forwardly-directed (adult), but the anterior portion of the snout is quite long (subadult). The brow horns are directed forward (adult) and are unusually short. The parietal-squamosal suture appears to be lost (adult), but the epoccipitals are reasonably distinct and not entirely rounded (subadult). Where would YPM 1834 fit on Horner & Goodwin’s growth series? This is Triceratops elatus, USNM 1201. It also displays some curious features. The nasal horn’s growth seems to have stalled: the underlying nasal is indeed reaching forward (subadult), but the epinasal is still apparent (juvenile). The brow horns are large and directed forward (adult). The frill’s margins are bumpy—the epoccipitals have largely been absorbed (adult). Notice the distinct upward bend to the squamosals. While it gives the bones a superficially onion-knife appearance, the parietal curves distinctly upward rather than being directed back. Where would USNM 1201 fit on Horner & Goodwin’s growth curve? Then there’s this famously odd duck: USNM 2412, Nedoceratops hatcheri. The nasal horn isn’t really a horn so much as a bump in the road, giving the snout a very pronounced “stepped-up” profile. The brow horns are quite large and directed almost straight upward. The frill is riddled with accessory fenestrae, some of which are probably the result of pathologic or natural re-absorption. 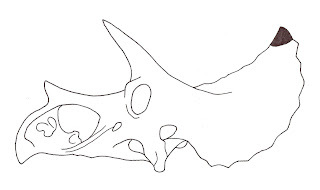 The skull retains distinct epioccipitals, and the squamosal has a bizarre shape. Nedoceratops may be too much of a wildcard to include in this analysis, but Scannella & Horner consider it to be a transitional form that would exist between MOR 004 and Torosaurus latus. But what happened to the nasal and brow horns? Where did all these accessory fenestrae come from? Surely, Nedoceratops is either an incredibly abarrant individual or a distinct taxon, and will not be considered further here. This is where things start getting interesting. This is Triceratops calicornis, USNM 4928, and it displays a lot of features that I listed for Torosaurus latus, above. In other words, its morphology conforms nicely to known morphologies that are consistent across currently-recognized specimens of Torosaurus. These include: a small, upwardly-directed nasal horn that is roughly halfway down the snout; a stepped-up snout profile with an elongate anterior portion; an elongate nasal passage; and squamosals that are onion-knife shaped. Most of the epoccipitals are completely re-absorbed. 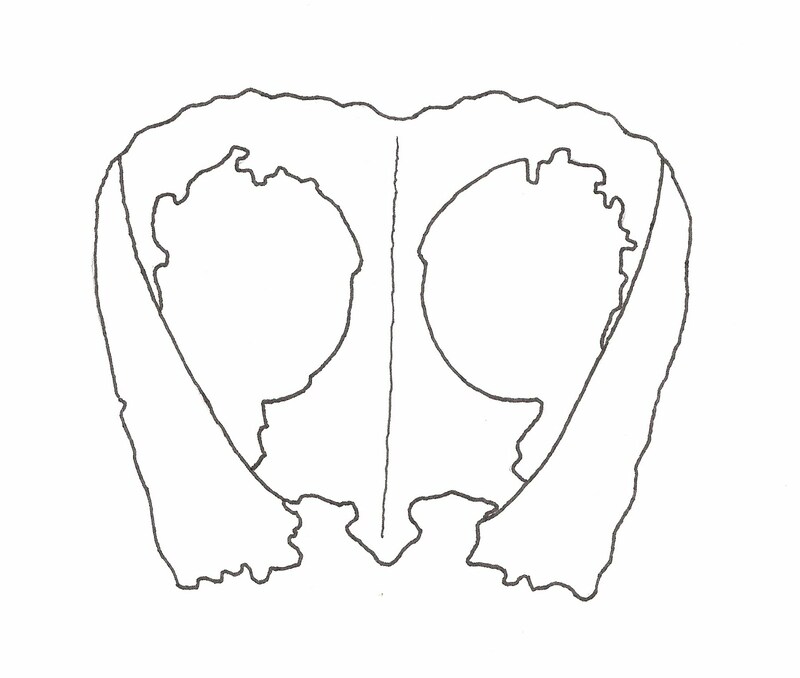 There is one distinct epoccipital capping the parietal-squamosal contact, and half of one above it. The parietal was not preserved in USNM 4928—it may have been fenestrated. AMNH 5116 (top) compared to YPM 1830 (bottom). The overall similarities are striking. MNHN 1912.20, housed in Paris, is strikingly similar to USNM 4928, although its “Torosaurus” features are even more obvious: the snout has a more pronounced “step-up,” the nasal horn is small and retains the epinasal. The anterior portion of the snout is elongate, as is the nasal passage. The frill is elongate and broad. Epoccipitals are nearly absent, and the squamosals are onion-knife shaped. Like AMNH 5116, the frill of MNHN 1912.20 has been heavily restored, although exactly how much of the parietal was “touched up” is not specified in this skull’s description (Goussard, 2006). 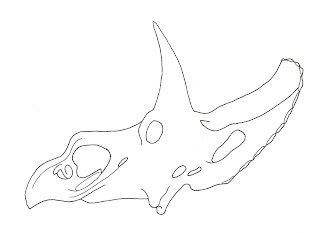 It may very well be that MNHN 1912.20 is a Torosaurus skull. AMNH 5116 (top) compared to MNHN 1912.20. Again, note the many similarities. Go back and look at the growth series picture at the top of the post. 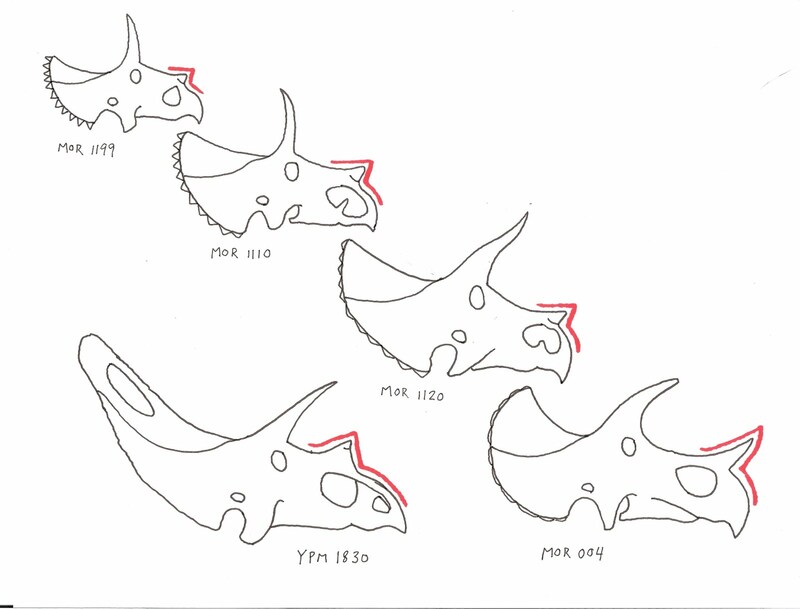 Diagonally from top to bottom, this is Horner & Goodwin’s proposal for ontogenetic change in Triceratops from small juvenile (MOR 1199) to adult (MOR 004). 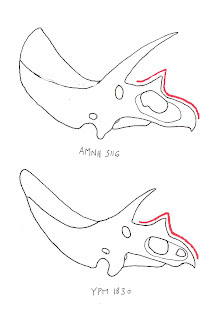 If Torosaurus latus were to follow MOR 004, the underlying geometry of the frill would have to change radically, the snout would significantly elongate, and the nasal horn would regress to an earlier developmental stage. Additionally, two giant holes would suddenly open up in the parietal! Scannella & Horner expect us to believe that all of these large-scale changes would happen in the dinosaur’s final years, and in stark contrast to the direction of growth that Triceratops had been experiencing up to that point. No other ceratopsian goes through this sort of late-stage transformation, and there is no reason to think that Triceratops is any different. Additionally, as pointed out by many readers, the rarity of “fully adult” individuals of Triceratops (Torosaurus) compared to the incredible abundance of earlier growth stages is a bizarre and unrealistic preservation bias that does not occur in other fossil animals. If anything, the opposite tends to be true: juvenile and subadults are rare while adults and “full adults” are more common. That is certainly the case in other ceratopsids, even among bonebeds. The bottom line is this: assuming the Horner & Goodwin growth series is generally accurate, YPM 1830 and MOR 1122 would NOT follow MOR 004. It really is that simple. However, Torosaurus material might not be nearly as rare as everyone seems to think. I believe that the genus can be distinguished based on more than just the presence or absence of parietal fenestrae. It’s possible that specimens once referred to as Triceratops are, in fact, Torosaurus. If nothing else, I hope this post has convinced some of you out there in Readerland that the Scannella & Horner paper presents interesting ideas but serious flaws as well, and needs to be given a second look. I offer an enormous, Pentaceratops-skull-sized thanks to Andrew Farke for taking the time to double-check my claims and correct others. Readers, notice that I don’t really talk about histeology or stratigraphy. This is largely because I am ill-informed to do so intelligently. I do think that Torosaurus is morphologically distinct from Triceratops based on skull anatomy alone, however, so those factors may not necessarily play a part. On the point of stratigraphy, however, I do wonder whether T. prorsus or T. horridus is older, and whether the similarities between the latter and Torosaurus may represent a close relationship. That is, perhaps T. horridus is closer to the common ancestor of Triceratops and Torosaurus, and that Triceratops prorsus is derived, anagenetically or otherwise, from T. horridus? All I can say really is bravo! Well written and very interesting analysis. What I find especially interesting is the mosaic of characters relating to diifferent ontogenetic stage. Someone should really look more into that. I have to say that this is certainly a much better presented argument than Toroceratops round 1, but it suffers from the same lack of understanding, of the specimens and the primary literature. For starters you are making claims regarding specimens that can not be supported on the grounds that the features claimed to represent the particular morphology in question are heavily reconstructed and their true appearance unknown. Another thing I noticed is that you are making far too big a deal out of the fact that MOR 004 was chosen to represent the morphologically oldest stage of growth in the Horner & Goodwin study. In the process you end up confusing characters used by Forester to separate the species T. prorsus from T. horridus with the characters Horner & Goodwin use to identify their growth stages, and actually end up creating a straw man. This is the fundamental flaw in your argument, but it does highlight the one weakness of Scannella and Horner's paper, that they have not published the strat data nor did they work out which species of Triceratops Torosaurus latus is a junior synonym or if all specimens of latus can be assigned to a single species of Triceratops. I find it quite telling that even after all that you end up identifying that Triceratops horridus morphology is always the mophologically closest to the Torosaurus morphotype. Oops, my apologies that should be spelt "Forster" not "Forester." "This is the fundamental flaw in your argument, but it does highlight the one weakness of Scannella and Horner's paper, that they have not published the strat data nor did they work out which species of Triceratops Torosaurus latus is a junior synonym or if all specimens of latus can be assigned to a single species of Triceratops." Why publish an argument for supposed synonymy of a genus or species, but ignore actually demonstration of synonymy by comparison of the types? If the stratigrpahy better affirms this, then producing it before determining synonymy would have been better, in form; this is especially important if, as I suspect, the authors would refer some T. latus specimens to T. prorsus and others to T. horridus; but this doesn't tell us the fate of T. latus' type, whence the name follows. Idk. I think the intent was to demonstrate that Torosaurus is just something akin to a "form genus" and that its morphology is consistent with extrapolated growth trajectory of an adult Triceratops. Does it even actually matter at this point, to which species of Triceratops it gets sunk into? T.latus, being the only species within Torosaurus is effectively just as nomen dubium now as Torosaurus. Im not sure the holotype of latus even preserves enough of the diagnostic features of either Triceratops sp to allow it to be "formally" synonymized. Off hand I think it has one unambiguous character, open frontal fontanelle. This rules out prorsus, but the character is plesiomorphic with respect to all other ceratopsids. Now horridus is basically just all specimens of Triceratops bearing the plesiomorphic condition of a number of discrete characters. So...maybe? Personally, I think that all specimens of latus are referable to horridus. The Saskatchewan specimen of Torosaurus, which usually gets side stepped or ignored in these discussions because its quite clearly not latus, may be a prorsus. The specimen not only occurs along side some very large prorsus skulls but also has squamosals that are highly suggestive of prorsus squamosal morphology. No, they didn't. They hypothesized. There is a difference! Very impressive and well thought-out. And thank you for including so many illustrations! "Adult growth stage characters are: postorbital horns oriented strongly anteriorly; epoccipitals flattened dorsoventrally; and merge onto the posterior frill margin. The adult growth stage of Triceratops is exemplified by MOR 004." "Ontogenetically, the nasal horn increases in size and mass, often extends over the anterodorsal sutural surface of the nasals. Fusion of the epinasal to the underlying paired nasals anterodorsally occurs in the subadult growth stage. 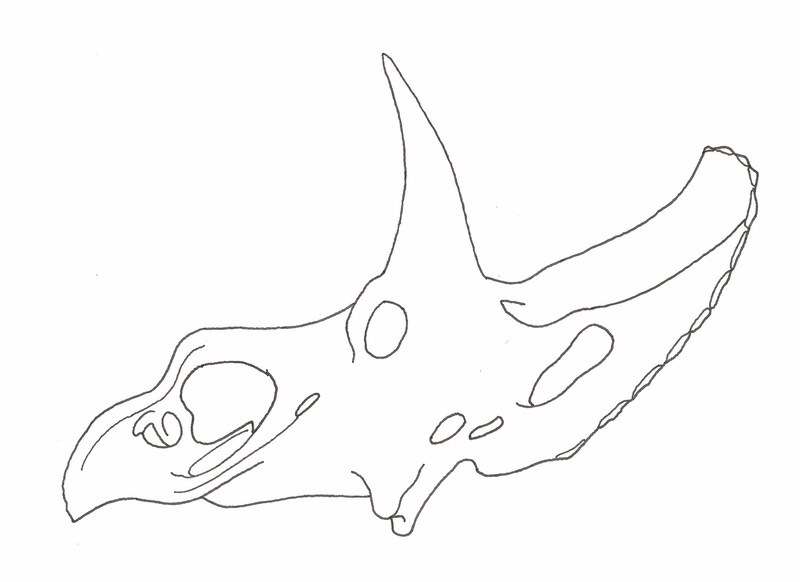 The base of the horn becomes larger than the breadth of the paired nasal bones beneath it. The nasal horn may extend anteriorly over the premaxillae as it enlarges, becoming highly variable in size and profile in adult skulls." This nasal horn morphology is NOT consistent with nasal horns in Torosaurus, which are supposed to be "fully adult" Triceratops. "Expound?" Is that even a word? I meant "expand." The ontogenetic character here is "nasal horn increases in size and mass." Thats it. All the "may" and "often" qualifiers that come after that are accounting for the different trajectories seen in the two species of Triceratops. Except for MOR 1120, all the juveniles in Horner and Goodwin are horridus. Whereas MOR 004 happens to be a prorsus. It has the diagnostic (Forster 1996) appearance of the snout and typical (though not necessarily diagnostic) prorsus appearance of the nasal horncore. 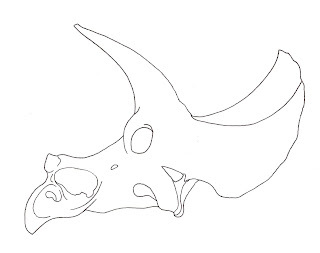 The nasal horncore of MOR 004 is large and masive, therefore its a adult/young adult. The fact that the horn core in MOR 004 is also elongated and directed forward and up, has less to nothing to do with ontogeny and everything to do with the fact that the specimen is a prorsus. "This nasal horn morphology is NOT consistent with nasal horns in Torosaurus, which are supposed to be "fully adult" Triceratops." So what? Known Torosaurus specimens don't have a prorsus type horn core morphology, big deal. You showed your self that they do have a horridus type morphology. That said, each specimen of Torosaurus has its own flavour of nasal horn core morphology. In ANSP 15192 while its small it does happen to be directed forward. MOR 981 and 1122 show evidence that suggest reabsorption. Perhaps the Nasal of ANSP 15192 was more like MOR 004 and has been reabsorbed through its ontogeny. In any event I'm a little wary about relying too much on any of the old specimens of Torosaurus given how much reconstruction has been done. Of course that is just as pertinent to consider for Triceratops. Good Day/Good Night to all of the bloggers here. Wow, both the Torosaurus-is-no-Triceratops and Torosaurus-is-Triceratops side offer very convincing evidence. However, let's not rely on just one line of analysis. Horner had said that ceratopid skulls are composed of metaplastic bone,a type of bone that could change in form quickly and drastically. Given that said characteristic, it would be much better if an independent analysis would be performed on specimens of the two taxa. One such test is the External Fundamental System(EFS) analysis of the limb bones of Triceratops sp. and Torosaurus as suggested by Dr. Thomas Holtz Jr. in one blog. If either any of the Triceratops possess EFS on their post-cranial skeleton or any of the Torosaurus lack them, that would refute Scanella and Horner's claim of synonymy between the two taxa. If only Torosaurus have them and none of the Triceratops possess EFS on their post-cranial bones, that would further support their claim. However, I would like to caution that a histological analysis may potentially be misleading. For example, if a blue whale skeleton and a humpback whale skeleton happen to fossilize in one area, and a histological test was performed in their fossilized bones, then the possible result is that they are the same genus and the person doing such an analysis may conclude that one is the old adult for of the other. This is not to undermine or criticize Scanella and Horner's analysis. Just as I have mentioned before, several lines of evidence should be examined. For example, analysis of behavioral evidence could contradict histological tests. Consider Andrew Farke's paper on horn combat in Triceratops. If I remember right, Scanella had mentioned that a Torosaurus-stage Triceratops would rather not risk damaging its crest in horn-locking combat. 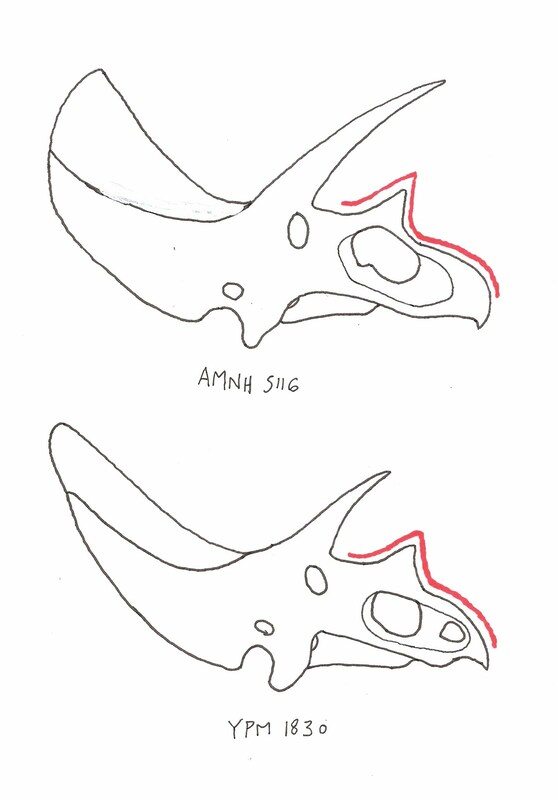 Yet Farke's analysis showed that the overall type/pattern of damage in the neck crests of Triceratops is consistent with horn-jousting activities. There are cases in which closely-related but distinct taxa may be separated by behavioral differences. Conversely, members of the same species may exhibit sexual dimorphism and behavioral differences between the sexes. With that, I also consider the possibility that Torosaurus is the sexual dimorph of a species of Triceratops. 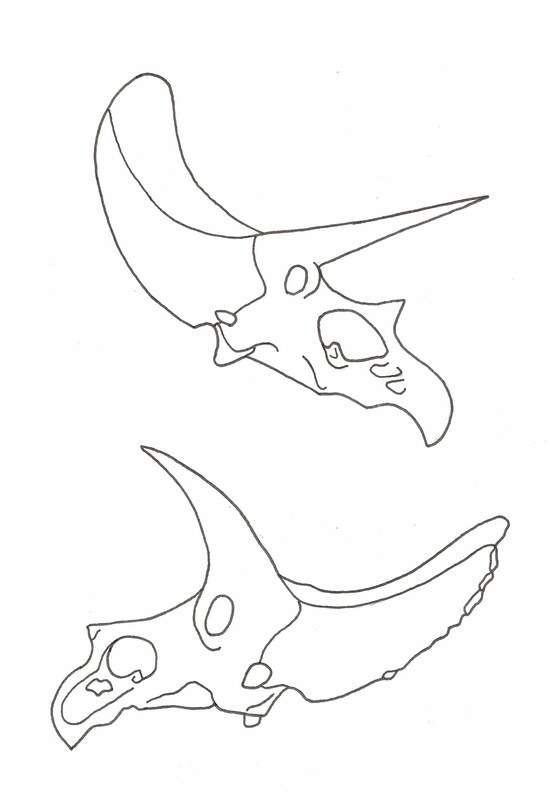 Following Farke's analysis that the neck-crest of Triceratops have serve defensive purposes, it is possible that male Triceratops retained solid crests for defensive purposes since males would most like engage in horn combat(based on observations of horned animal males, such as Jackson's chamelion and several species of bovids); the females, meanwhile, would develop fenestrated frills and become the "Torosaurus" form(or maybe it is the toher way around). I forgot to say these points a few days before: why don't Horner and Scanella also try such an analysis to Styracosaurus albertensis and Rubeosaurus ovatus, or better yet, all ceratopid genera. To be consistent with Horner and Scanella's explanation, it would be better if the cranial bones from each and every ceratopid species would be subjected to their histological analysis to determine if all those genera are valid or not. Another thing is that if soft tissues could be recovered from 68-million year old T. rex bones, then there is no reason to believe that the same could not be done to ceratopid bones. If I were in Horner's position, it would be worth smashing bones from 10 Triceratops specimens and currently available Torosaurus material they had excavated from the field in order to extract, say DNA fragments. Then subject those fragments to PCR (if possible)and perform genetic analysis of the DNA samples from the two genera to determine their synonymy. Even a tiny variation between their DNA could spell a huge difference. For example, humans share 98 or 99 % of their DNA with chimpanzees. This is never meant to embarass the two of them. I am only following the logic of their analysis. Also, about the blue whale and humpback whale analogy I have mentioned before, the two genera have almost identical skeletons that if they become fossilized in one region with one of them being not fully mature, a histological examination of their bones could result in an erroneous conclusion that the two are the same genus and/or species. Hence, histology alone is not reliable. They should have also accounted for the possibility that different species/genera could have almost identical, if not completely identical skeletons and that the difference could only be confirmed accurately by DNA analysis. Read Scannella's SVP2010 abstract too (embargo precludes comment here). All but one of the Horner & Goodwin growth series are T. prorsus. Rediagnosing the growth series and taxonomy of Triceratops are parts of Scannella's thesis, which is supplemented by cranial material from over 60 new specimens, and included histological analysis. Stop trying to second guess his research. Go to MEETINGS! See the presentations! Some Torosaurus specimens are T. horridus, fewer are T. prorsus. Some may be something else. We're in the process of finding out using DATA not just ill-informed opinion and century-old specimens without any field collection data. 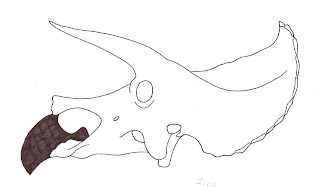 "In centrosaurines, for instance, the adult frill is, by and large, simply a larger version of the juvenile skull"
Except that the parietal fenestrae not only get larger through ontogeny, but that there may be no fenestrae in the smallest known centrosaurines. Read the primary literature. Look at figures. "These sorts of radical morphological changes have no basis in close relatives of “Toroceratops.”"
Really? Squamosal elongation is seen through ontogeny in other chasmosaurines. I guess you haven't read the literature on the subject, but hey, who needs to when you've got opinion eh? "Readers, notice that I don’t really talk about histeology or stratigraphy. This is largely because I am ill-informed to do so intelligently." My SVP talk this year is partly on how you just can't do this anymore. Imagine I said "i just can't talk about morphology intelligently, but my stratigraphy is great": would you take me seriously as a taxonomist? If you can't do stratigraphy and ontogeny, then you can't understand the origin of morphology. Period. "I do think that Torosaurus is morphologically distinct from Triceratops based on skull anatomy alone"
It is. Definitely. "Torosaurus" looks different from Triceratops: that's because it's of different ontogenetic status. Do you look the same as you did as a baby? Is it really that hard to grasp ontogenetic change? we see late-stage ontogenetic change in other dinosaurs (e.g. hadrosaurids).. it's not unprecedented. "On the point of stratigraphy, however, I do wonder whether T. prorsus or T. horridus is older"
I wonder whether you bother to read anything before you write stuff like this. "...and that Triceratops prorsus is derived, anagenetically or otherwise, from T. horridus?" Borderline plagiarism or just plain ignorance.. (see above). df9465: You seem angry. How am I second-guessing Scannella's research? I didn't know a stratigraphic study of Triceratops was coming out--it's just a question I thought of literally while I was writing the post. I'm not sure where you get the "borderline plagerism" attack, either. One species of Triceratops has to be closer to Torosaurus than the other one (assuming they're separate species). Either T. horridus and Torosaurus branched in separate directions, and T. prorsus split early or evolved directly from it, like all those species of Thalassocnus. You're making a lot of very angry, kind of personal attacks. Makes me think I've unwittingly hit a nerve. I have noticed that skulls are the parts most often used in Horner's research. But did the post-cranial bones got histological examination? And what about molecular analysis? I know that I sound repetitive now but for me, anatomy and histology alone are not always truly reliable. Without molecular analyses, a fool-proof identification is impossible, so I think it wouldn't be bad for Horner if he would examine each and every Triceratops and Torosaurus material freshly collected from the field for the presence of soft tissues that may possibly harbor DNA and/or polypeptide chains. Molecular analyses is hard but is always the most reliable method for taxon establishment and identification in animals. This may hurt Horner and Scanella's research but in my opinion, without the molecular analyses, Horner and Scanella's method is greatly flawed. Do you suppose that ALL horridus specimens are the same animal as Torosaurus, or SOME, like AMNH 5116? Probably only some of them.